The Casa Batlló - with its curved-backed dragon on the roof - is one of the best known private homes of the famous architect Antoni Gaudí. Here, he depicted the Dragon of Saint George legend. Your major advantage: tickets without having to queue! 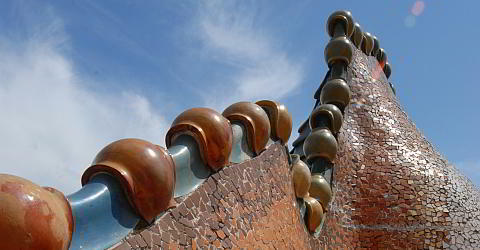 The roof of the famous Casa Batlló is shaped like the back of a monster, gleaming with large shiny scales. It consists of ceramic tiles and glazed tiles. Here you’ll get a special impression from inside the building, which is on UNESCO’s World Heritage List. Gaudí always oriented himself toward nature in his design. Curved and organic forms dominate throughout the building. Did you know that Gaudí also designed furniture? Look behind the famous flowery facade of one of Barcelona's main attractions with unique balconies. Your Advantage: You will immediately receive the voucher by e-mail after booking, which entitles you to entry without queuing! The voucher is valid for a calendar year for a single entry. Admission without queuing every day until 21.00. Our vouchers are available throughout the calendar year valid for a single entry. Daily: 9.00 - 21.00, last entry at 20.20. Not valid on 1 January and 25 December, restricted access possible during events. With the Barcelona Card you get the 20% discount only at the ticket counter. Please note that there may be longer waiting times when buying tickets at the ticket counter. The booking is easy: just enter the number of desired admission. Then click on "Add to cart". After booking is complete, you get the voucher which anables you for admission by e-mail. Also you get a detailed direction. You can cancel a booking until 31 December if a voucher is not used. Please enter the desired number of tickets and skip the line.